You are using an outdated version of Internet Explorer. Newer versions of IE are significantly more robust. To use the Qualys BrowserCheck tool, we recommend that you upgrade to the latest version of Microsoft Internet Explorer or use the latest version of Mozilla Firefox. You are using an outdated version of Firefox. Newer versions of Firefox are significantly more robust. To use the Qualys BrowserCheck tool, we recommend that you upgrade to the latest version of Mozilla Firefox. I just scanned my browser using Qualys BrowserCheck and I think you should too. This tool will perform a security analysis of your browser and its plugins and identify any security issues. If security issues are found, you just need to follow the recommended actions to get software updates and fixes. Thank you for installing the Qualys BrowserCheck Browser Extension. In order to perform a full and thorough system scan, you will need to download and install the Qualys BrowserCheck host application. Restart your browser when installation is completed to begin the scan. 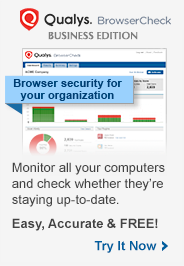 An update is available for the Qualys BrowserCheck Browser Extension. In order to perform a full and thorough system scan, you will need to download and update the Qualys BrowserCheck host application. and plugins, and will run several system checks including the Top4 Security Controls. Click the "Install Plugin" button to enable fast, safe scanning. Scan and view all security issues in an easy-to-understand detailed list. Follow recommended steps to resolve each vulnerability found. Click on a browser button to see related items. Disabled status for result items is not available with this scan type. © 1999-2019 Qualys, Inc. All Rights Reserved. Qualys, the Qualys logo and QualysGuard are registered trademarks of Qualys, Inc. All other trademarks are the property of their respective owners.